restylingmag.com January 2015 | Restyling & tRuck AccessoRies 13 bak box bak Industries, San Fernando, Calif., presents the BAK Box. Add to any BAK Flip or Roll-X tonneau cover to keep the small parts or- ganized and secured underneath the cover. 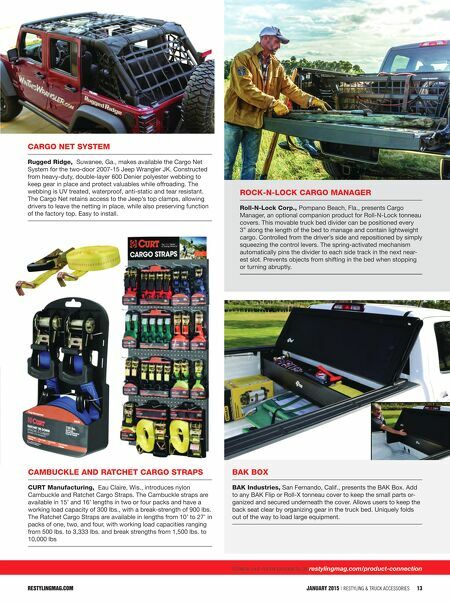 Allows users to keep the back seat clear by organizing gear in the truck bed. Uniquely folds out of the way to load large equipment. Check out more products at restylingmag.com/product-connection cargo net system rugged ridge, Suwanee, Ga., makes available the Cargo Net System for the two-door 2007-15 Jeep Wrangler JK. Constructed from heavy-duty, double-layer 600 Denier polyester webbing to keep gear in place and protect valuables while offroading. The webbing is UV treated, waterproof, anti-static and tear resistant. The Cargo Net retains access to the Jeep's top clamps, allowing drivers to leave the netting in place, while also preserving function of the factory top. Easy to install. restylingmag.com cambuckle anD ratchet cargo straps curt manufacturing, Eau Claire, Wis., introduces nylon Cambuckle and Ratchet Cargo Straps. The Cambuckle straps are available in 15' and 16' lengths in two or four packs and have a working load capacity of 300 lbs., with a break-strength of 900 lbs. The Ratchet Cargo Straps are available in lengths from 10' to 27' in packs of one, two, and four, with working load capacities ranging from 500 lbs. to 3,333 lbs. and break strengths from 1,500 lbs. 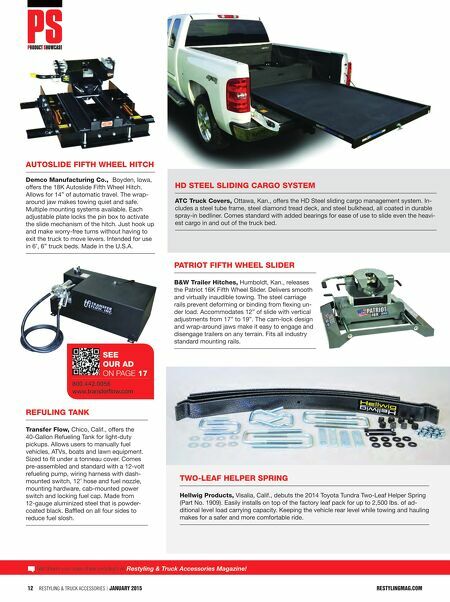 to 10,000 lbs rock-n-lock cargo manager roll-n-lock corp., Pompano Beach, Fla., presents Cargo Manager, an optional companion product for Roll-N-Lock tonneau covers. This movable truck bed divider can be positioned every 3" along the length of the bed to manage and contain lightweight cargo. Controlled from the driver's side and repositioned by simply squeezing the control levers. The spring-activated mechanism automatically pins the divider to each side track in the next near- est slot. Prevents objects from shifting in the bed when stopping or turning abruptly.